The Westport Municipal Advisory Council was created by the Mendocino County Board of Supervisors on December 4, 2007 under the provisions of California Government Code Section 31010. MACs are advisory bodies created to survey community opinion and attract grants for desired community projects. They have no authority to tax or enact ordinances. 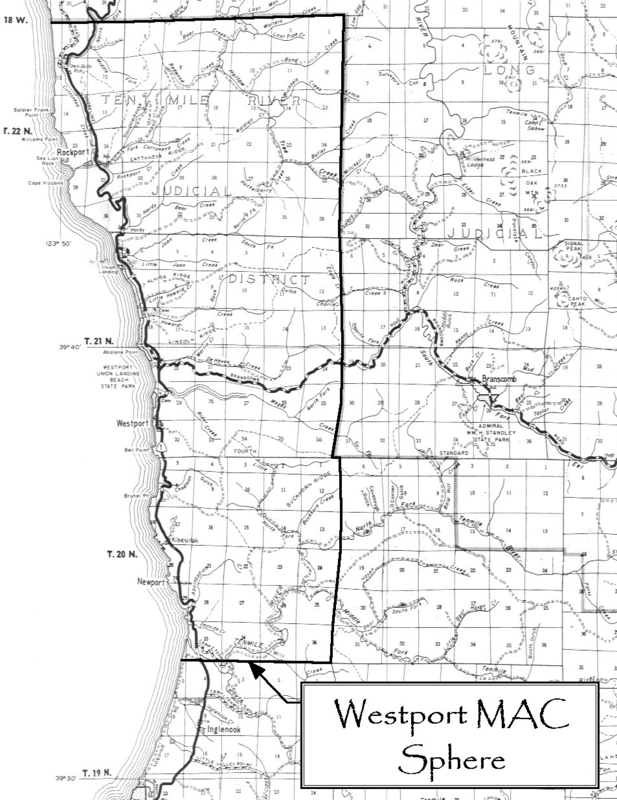 The boundaries, mission, and structure of the WMAC are defined in BOS Resolution No. 07-245. The WMAC's duties were later expanded on November 3, 2009 by approval of an amendment found in BOS Resolution No. 09-245 and the terms of its Directors were clarified in BOS Resolution No. 12-094. General and Local Coastal Plan amendments, rezoning, coastal development permits, and subdivisions. Emergency response and public safety. The WMAC operates under Bylaws that set forth a process for conducting regular public meetings and issuing advice. That advice may incorporate minority opinions to ensure the full spectrum of community concerns and opinions are communicated. The WMAC is made up of five directors and one alternate director appointed by the BOS. Current appointments, vacancies, and contact information can be found on the WMAC Contact page. WMAC directors must comply with Brown Act and Conflicts of Interest mandates. Meetings are held on the first Tuesday of each month at 7:00 PM at the Westport Community Church, unless noticed in advance for a different date or cancelled by a notice published on this web site. Meetings may be cancelled for lack of agenda items supplied by the public and WMAC Directors. Agendas are posted at least 3 days prior to each meeting on the Next Meeting page of this web site and on the bulletin board at the Westport Community Store. Public comments are encouraged on topics that fall within the WMAC's mission (stated above) and geographic area. You may submit agenda topics and send comments by emailing WMAC or writing to P.O. Box 307, Westport CA 95488.